Today’s post was written by Cathy Quigan, Digital Learning Technology teacher at Sacred Heart Girls’ College. I teach Digital Technologies from Year 8 to Year 13 at a girls’ high school with 700 students. As part of the curriculum, I teach everything from basic document formatting and spreadsheets to programming, web and game design. I try to give the students a broad base of skills, so each year focuses on a different project of the student’s choice. At the beginning of the year we discuss issues that are relevant to them—such as how the work that they do is recognized by the school—and we come up with ways we can address these issues using IT skills. The solutions are always varied, so that at any given year level, I can be teaching up to three very different sets of skills. In addition, due to the lack of students choosing technology as a subject, I have several classes with different year levels in the same computer lab, at the same time. For example, in one class I have Year 10, Year 11 and Year 12 students, who have a variety of skills. 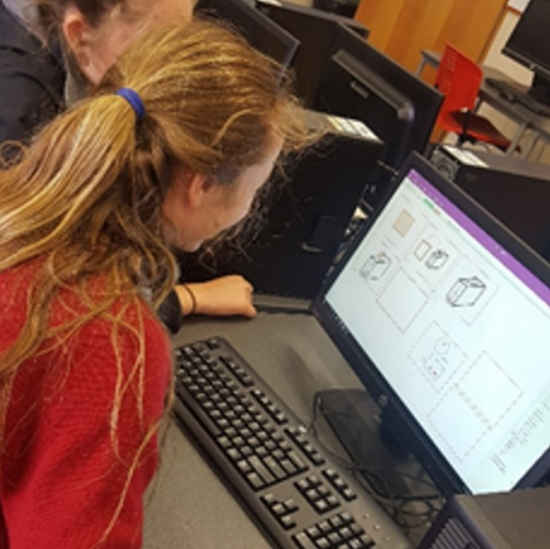 Currently, my Year 10 students are working on projects that involve word processing and graphing survey results, Year 11 students are learning to construct a basic program and Year 12 students are designing print media and websites. My Year 12 students are spread across two different classes. I have two students in my mixed class above, and I teach the rest of these students at the same time as my Year 13 students, at a different time. It becomes clear then that teaching and learning in my classroom needs to be organized and individualized. Each year group has a OneNote Class Notebook set up with tasks to complete either individually or in collaboration with others. 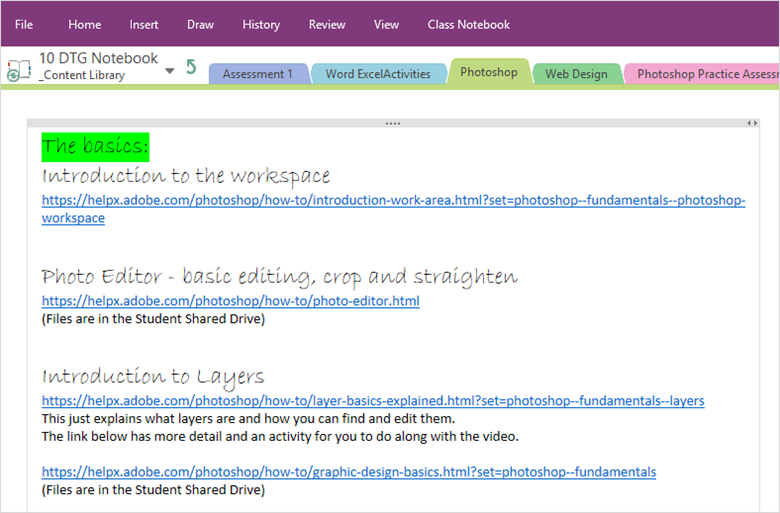 These OneNote Notebooks contain resources and instructions, allowing students to work independently, at their own pace. Year 12 students, who work in separate classes, all have access to the same teaching and, seeing as all the discussions and group work is recorded (either in written or audio form) in the Collaboration Space, no one misses out on any of the teachable moments. Another benefit of the OneNote Class Notebook is that I can store resources like tutorials, links and how-to guides, so that students can access them at their own pace as and when they need them. This allows them to be self-sufficient while I work with other students. 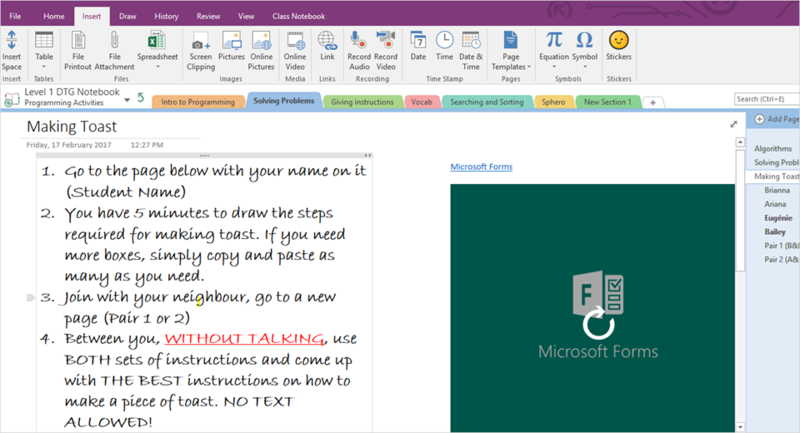 In this activity, Year 11 students used OneNote to deconstruct a problem into small steps. This is a well-known activity that is often carried out using Post-it notes. However, with two other year groups working in the same space, OneNote allowed the students to work collaboratively but, at the same time, quietly. This activity was their initial introduction to programming, although they were not yet aware of this. Following some confused looks and wondering whether I had lost my marbles, their first task was to draw the steps for making toast individually on a page in the Collaboration Space. 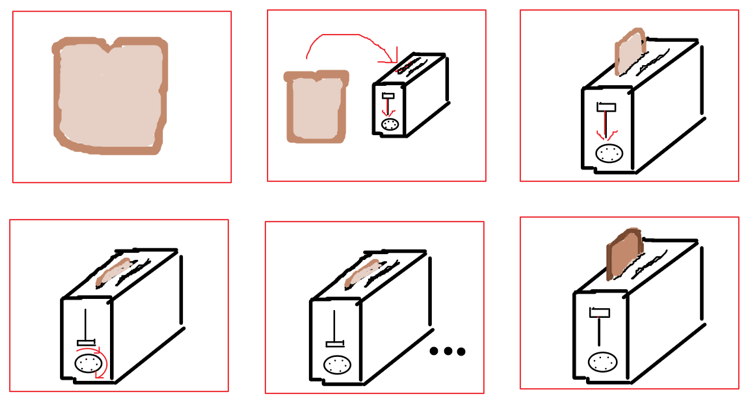 They then had to work together, in the Collaboration Space, without speaking, to put together the best sequence of steps to explain how to make toast. This allowed them to identify any issues (bugs) in their thought processes and to identify where the process could be more efficient. It also forced them to improvise and communicate in different ways instead of their normal verbal cues and hand gestures. Students began to get an idea of clarity and efficiency in giving instructions. At different points throughout all the activities, we give feedback. 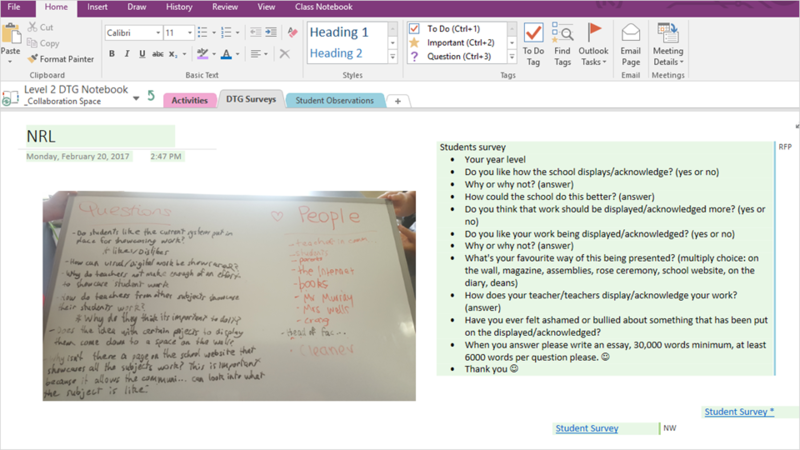 Given the nature of the mixed class, this is not always possible to do face-to-face, so we use Microsoft Forms embedded in OneNote to record their thoughts and come back to discuss them later. The second task they completed focused on giving instructions. Students had to give clear instructions for others to follow to make their way through a maze. In this way, they gained understanding of the “language” that computers “speak” before being introduced to any specific terminology. For this activity, each student drew a maze, as above, in the Collaboration Space. 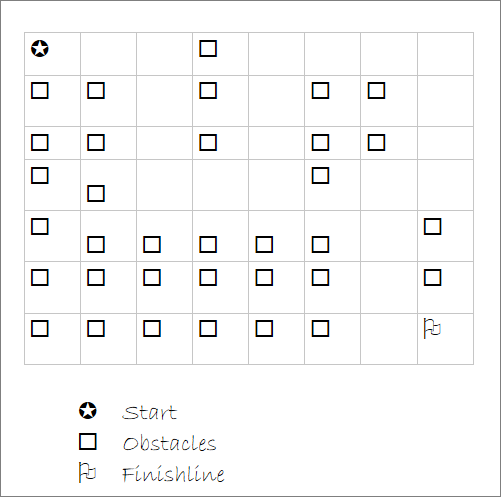 A second student wrote out the directions to get through the maze using only arrows. A third student read these instructions out loud while the others drew them. We took to the chalk and pavement, as it was right outside my classroom window, so I could still supervise. 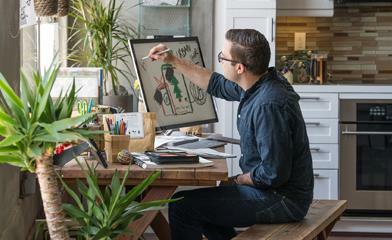 But this would have worked equally well if carried out in OneNote using Surface Pro or another digital inking device. Even (dare I say it…) on paper! Completing this activity was a great time for feedback. 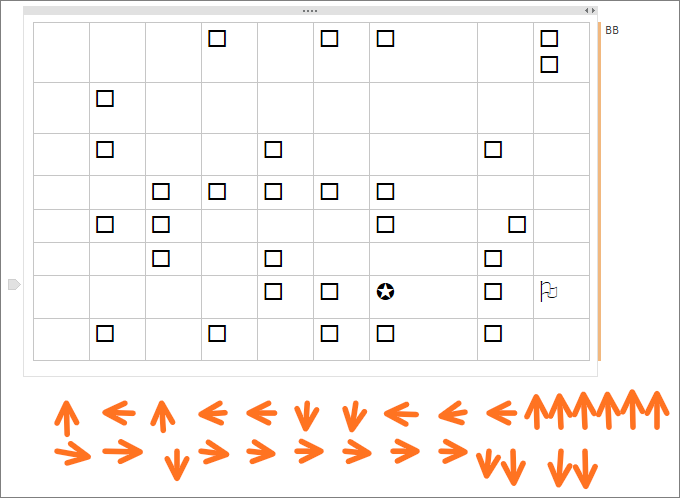 Realizing that they have drawn different shapes even though they have received the exact same set of instructions and working out why this happened is key to understanding programming. Commands must be specific and precise if they are to be followed accurately by an inanimate computer that has no understanding of nuances. It is only at this point that the students began to actually look at coding. 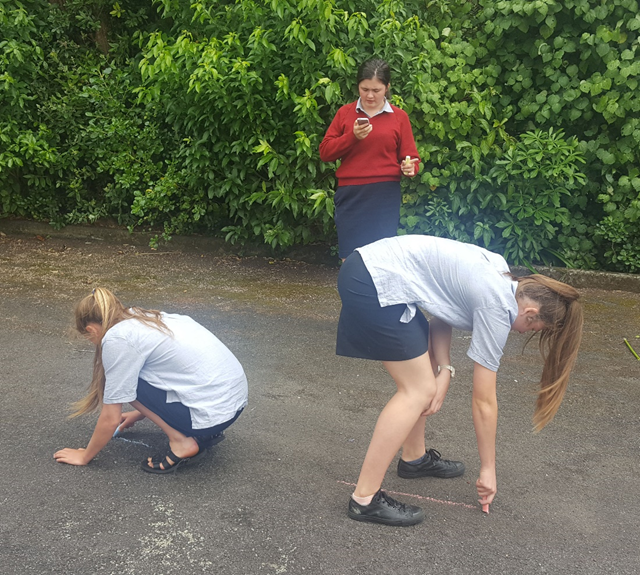 Using Sphero robotic balls and Lightning Lab on their mobile phones, the students converted their instructions into block-based Oval programming language. This allowed them to see their instructions in action. They got to see the blocks of code and the kinds of instructions a computer will need to complete a set task, in this case, directing the Spero around the maze. Over time, by comparing different sets of instructions, they also learn the value of efficiency in programming. It also boosted their level of engagement. Who wouldn’t like to play with robotic balls at school and call it “learning?” I didn’t need to refocus their attention very often. The assessment for this course required the students to construct a basic program for a specified task. They decided to choreograph the Spheros to a piece of music. They used the Collaboration Space to collate their planning so that they all had a record of what they needed to construct. Students wrote their individual programs themselves and came together to test the movement. They went from programming novices to a coding choreographers in a matter of weeks with very little coaching from me. Having resources and activities prepared in OneNote made it easy for the students to thrive in the mixed-level classroom. The students were engaged, autonomous and motivated. 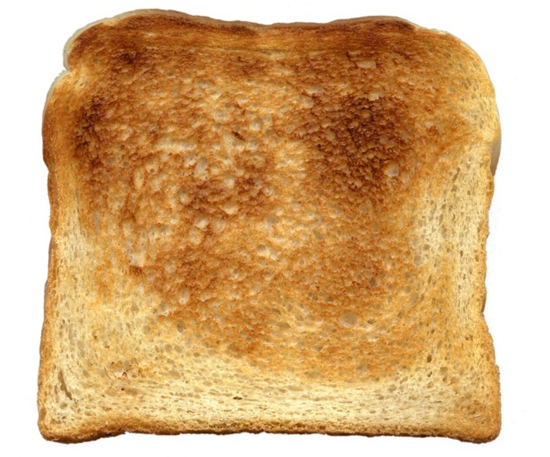 And it all started with making toast.